1. To continue and to improve my process of recording my research, especially when I search online databases. I've done much better than I ever have in recording where I've been when searching online, but there still is room for improvement. My problem is impatience...I don't want to slow myself down to record where I looked, and then I end up wasting time in the long run by repeating searches. I did create an Online Research Form to help me, and I resolve to do better in 2008. 2. To cite my sources properly. It's a lot of work, especially to go back and re-cite 20 years' worth of information that I used to enter in note form on my computer. I give myself an A on this resolution, as far as my databases went. I used my RootsMagic citation wizard a lot this year and went back and started re-entering (or entering for the first time) my sources. There's still much work ahead, but the acquisition of Evidence Explained! was a bonus for my genealogical toolbox. I do need to make sure that I cite my sources correctly on this blog, and go back and cite old posts. 3. To photograph and log my genealogical "treasures," items that have once belonged to my ancestors and late relatives. Hmm...I kind of forgot about this one. I was going to have a private blog to log the treasures, but I think Tim Abbott's Cabinet of Curiosities is going to be a good way to record these. Scanfest is also a part of this. I'll renew this resolution as well. 4. To begin to slowly change my hard copy files from a file folder system to a notebook system, using archival-safe, acid-free page protectors. Nope. This one was a dud. It was expensive, time-consuming, and an inefficient way for me to store and access my records. I started to keep my HOEKSTRA materials this way, and although it looked very good and professional, it just was plain awkward. My original plan was to prepare materials for a possible book, but I've got too much research ahead of me to do any near publishing. I've decided to stick with file folders for all my family lines, and I've been implementing Sharon DeBartolo Carmack's system explained in Organizing Your Family History Search. RootsMagic allows me to color code family lines, and I'm using colored folders for my files: blue for my dad's lines, red for Mom's, and green and yellow respectively for my father- and mother-in-law's lines. Also, orange is for my maternal step-grandfather's family and purple is for my paternal grandmother's adoptive family lines. So while the original resolution didn't work, its alternative has. 5. To continue to blog at this location...to be consistent in writing both prompts and responses for my new blog, AnceStories2. I deserve an A+ for the first part, but receive a D for the second. This is my 340th post since last year's resolution on this blog, but I sloughed off badly on AnceStories2. I don't want to abandon it, so I've decided to continue to post enough prompts up to Week 52, giving readers a year's worth of prompts. From that point on, I'll probably blog occasionally on various other ways to record one's memories. My 2008 resolutions are to continue with the five points of focus above, either in the same vein or the altered goal I've mentioned. Additionally, there are two other goals I want to work on, preservation and writing. The first requires that I lease a safety-deposit box at my financial institution in which to safely keep original documents and family treasures, photo negatives, and computer backups. I'm also going to buy some larger flash drives to back up my files on a regular basis. The second involves doing more non-blog writing by submitting articles for publication. But I'd also like to blog my mother's letters in a private blog, perhaps as preparation for a book. There you have it: record; cite; archive and preserve; organize; and blog and write. I think I'll make a little sign with these goals and hang it near my computer as a daily reminder. What are your goals or resolutions for 2008? I've been using the California Death Index at RootsWeb a lot this evening to look up Midkiff descendants for my husband's family tree database. A distant cousin is preparing to publish a new book on the Midkiff family, and has asked that we submit updated descendant reports of their primary ancestors, Franklin Preston MIDKIFF and Ellender "Nellie" OLIVER. Of course, any living descendants will not be included, but there is much data in the family tree that needs tidying. I'm particularly looking up death dates and places in the various death indexes online, both state death indexes and the Social Security Death Index, for those descendants that are likely to be deceased (appearing as aged 80 or above in hubby's database). A couple of things I noticed of which other researchers should also be aware. The first is that the Soundex feature doesn't apply to either the mother's maiden name or father's last name when running a search; only the surname of the deceased that you are searching for will have their name Soundexed. That may be true of the Metaphone feature as well (I haven't checked). So searching for children whose mother's maiden name is Midkiff, and using the Soundex feature will only bring up the exact Midkiff spelling under the category "Mother's Maiden Name," and not Medkiff, Medkeff, Metkeff and other strange varieties that I often see. Another warning comes with possible errors in the California Death Index where it is linked to the Social Security Death Index, also on RootsWeb. I found that John Leland KIRBY, Sr., who married a Midkiff descendant, had the Social Security number 560-03-5333 linked on his entry in the California Death Index. When I clicked on the link, I was brought to the SSDI page for Louis ESCALLIER ("What the heck?!"). Running John's birth and death year through the SSDI search engine cleared up the matter. His Social Security Number was 560-03-3333. Also, the SSDI states his birthday was 22 Oct 1899, whereas the California Death Index says 22 Sep 1899. So which is correct? It's hard to say, but my guess is that since the error for the Social Security Number came on the part of the California Death Index, then it's more likely that the CDI's birth date for Kirby is also incorrect. Looks like there was some sloppy data entry here (not that I've ever done that before!). All that said, the California Death Index is a great help and guide to obtaining original records. I've been able to sort out relationships and find more family members by using this resource. By putting this data on our family trees and then uploading my GEDCOM to RootsWeb's WorldConnect, I've been contacted by many Midkiff descendants over the years and been able to verify the information as well as share with them their family history. I started doing some simple searches on Ancestry.com, but did not get any matches to this family. I have lots more possibilities, but this is just a start. Below are the search terms I used and the subsequent results. I used my Online Research Log to keep track of my research. 1) This family is not on the census at all due to moving around the country (probably from Idaho and/or Utah to Northern California). However, given that it was winter, that probably doesn't make sense. 2) They are on the census, but "Midkiff" is badly mangled in the index...or was written as METCALF(E), a different Soundex code. 3) They are living with other relatives, and I need to look for all adult children and siblings of John and/or his wife, Margie. Although I started this blog nearly two years ago (16 January 2006), it wasn't until I started writing for the Carnival of Genealogy and switched to this current URL on January 22nd that things really took off for me, both as a blogger and in readership numbers. But really what has been the best reward of blogging my genealogy has been the sense of community and the dear friends I've made. From the many carnivals that have sprung up (Cabinet of Curiosities, Carnival of Central and East European Genealogy, Carnival of Irish Heritage and Culture, and the Advent Calendar of Christmas Memories) to Scanfest (the brainchild of Susan Kitchens, by the way!) to banding together during the Ancestry Internet Biographical Collections controversy, I've learned about the personal and genealogical trials and triumphs of people I've never met face-to-face (but hope to! ), and have been encouraged and educated by them along the way. I hope I've given equally in return. It was very exciting to have my local newspaper feature me in their Home and Garden section as they highlighted my genealogical treasures. Hopefully, my emphasis on the Eastern Washington Genealogical Society during the interview will increase awareness and attendance of our society within our community. I was also interviewed by U.S. News and World Report (as a user of Ancestry.com) and an representative of Google Reader's public relations department (on my Alice Teddy the Rollerskating Bear find here and here). U.S. News has so far not published my interview; and the Google Reader interview was for a possible future press release. That the media is covering genealogy and family history more and more is, I believe, an indication of public awareness and interest in these areas. Two large collections of documents, photos, and letters made their way into my home this past year. After the death of my maternal grandfather last January, I started receiving items from my uncle who was the executor of the estate of my grandparents. I'm still in the process of scanning, adding to my database, and analyzing what I call the DeVRIES-HOEKSTRA collection. Additionally, my uncle blessed me by doing his own on-site research--and then sharing it with me--on the houses that our families occupied in Grand Rapids, Michigan from the time the DeVRIES family arrived there in 1897. Secondly, one of my paternal aunts sent several CDs of scanned materials from my great-grandfather's experiences in North Russia at the end of World War I. My posts on this subject have generated a lot of readership, not just from the genealogical community, but from the military and history communities as well. I still have more posts to blog about his "adventures" there and what happened after he returned to the U.S. Recently, my children's paternal grandfather loaned me a box full of old and modern family photos and dozens of postcards received by his maternal grandparents, mainly during the years 1908 to the early 1950s. I look forward to scanning, entering into my children's paternal family database, and analyzing these materials. This year brought fabulous opportunities for me to make presentations to various groups around the Inland Northwest. In March, I did two presentations at the local LDS Church's Family History Conference, and in June, the Bonner County (Idaho) Genealogical Society invited me to be their featured speaker at their genealogical conference. I also had the opportunity to share "Frugal Genealogy" with the Kootenai County (Idaho) Genealogical Society in October. I also taught three EWGS computer classes for members this past year. These experiences allowed me to meet other researchers and see what kinds of resources are available in outlying communities. One of the results of some successful Online Beginning Genealogy classes that I taught through my local community colleges' district was being asked to start an Intermediate class, which begins later next month. I took a walk down memory lane by reading the letters my mother had written to her parents from 1966 - 1978. There's some terrific material there...perhaps even a book. Some wonderful volunteers at Find A Grave were able to take photos of graves of ancestors of my husband and me. These included my 3rd-great-grandmother, Maria Marina (VanKLINKEN) TON BYL, made all the more bittersweet since she is buried in a Potter's Field in an unmarked grave. As I've mentioned above, I discovered my ROBBINS family was instrumental in starting up an American Legion Post, and my JACKSON relatives trained a rollerskating bear! Another great discovery was finding my husband's WESTABY ancestors in the 1920 Census, at long last! It's always nice to be rewarded or earn something doing what comes naturally and for which you are passionate! Thanks to the great people at Footnote.com, Genealogy Publishing Company, and MemoryPress, I've tasted the sweet fruits of my labor. I can only dare to dream that 2008 can match or surpass 2007 in the wealth of what I've experienced! I wish all my readers, fellow genea-bloggers, and family members the very best in the coming New Year. May your brick walls come crashing down, and may all your ancestor hunts be successful and rewarding! I was up in the wee hours of the morning (teenagers, sleepover...need I say more? ), so I got on the computer and checked my Google Reader to catch the East Coast blogs' morning posts. Did you see that George G. Morgan is discontinuing his blog, "Along Those Lines..." to do more writing-for-pay as well as keep up with his busy lecturing schedule? We'll miss him. I'm sure someone's blogged about this before, but I stumbled across the Local History and Genealogy Reading "Room" of the Library of Congress' website. Of course, it was bookmarked immediately, and I suggest you do the same! Lori Thornton at Smoky Mountain Family Historian links to an article about the Boston Public Library Digitization Project. Exciting! We don't have much Irish heritage, my children's father and I. Both of us have ancestral lines that resided in Ireland for a couple of generations. A closer look at these families indicates that all but one--which came from France--immigrated from Scotland: the typical Ulster Scots. After a few generations, the families moved on to North America; my children's father's to Pennsylvania, North Carolina and Virginia, and mine to Ontario. His arrived during typical Scotch-Irish migration periods of the late seventeenth and early eighteenth centuries, while mine came over during the 1830s. I also have an adoptive line from Ireland. My paternal grandmother's adoptive mother, Nellie May CONCIDINE, was a second-generation American, whose paternal grandfather arrived from Ireland in New York State sometime before 1849, perhaps residing first in New Jersey. I haven't yet been able to get them "over the ocean," so to speak, so I'm not sure from which county they hailed. Am I ready to do Irish research? No. There are too many generations between us and our Irish-born ancestors for me to delve into this with any quality results. I've long ago learned the rule of genealogy to start with myself (or my children's father) and work backward through time, pausing to dig as deeply as I can to extract all possible clues before moving on to the previous generation. However, I can educate myself along the way, so when I do feel prepared to tackle these challenges, I will be equipped with the necessary knowledge and tools. One way is to read everything I can get my hands on about Irish genealogy, research, and history. I should also look at Scottish resources, to help me better understand the history, culture and migration patterns of the Ulster Scots. The genealogy room of the Spokane Public Library's downtown branch is stocked and staffed by members of the Eastern Washington Genealogical Society, and its collection holds a wealth of publications, especially on Irish genealogy. That will be a great place to start. Also, this past year, I acquired three books that I believe will be helpful in my quest. The first is General Alphabetical Index to the Townlands and Towns, Parishes and Baronies of Ireland Based on the Census of Ireland for the Year 1851 (1861; reprinted in 2000 by the Genealogical Publishing Company, Baltimore, Maryland). It is a 968-page chart of all the towns and townlands in Ireland, showing the county, barony, parish, and Poor Law Union of 1857 that each comes under, as well as listing their acreage, the sheet number of the ordnance survey maps, and volume and page number of the 1851 census on which each can be found. So, for instance, I can look up my SAYERS' ancestral home of Letterkenny, County Donegal, and find out that in 1851 (two decades after they left for Canada), this townland of a little more than 410 acres was situated in the Barony of Kilmacrenan, and in Conwal Parish, with a Poor Law Union of the same name. It can be located on Sheet 53 of the Ordnance Survey Map, and its information can be found in Volume III, page 126 of Part I of the 1851 Townland Census. All this information will be useful for when I start looking for various records and need to know what government units covered the area. Another interesting older reference work is Handbook on Irish Genealogy: How to Trace Your Ancestors and Relatives in Ireland by Donal F. Begley of the Irish Genealogical Office (1970; reprinted in 1984 by Heraldic Artists, Ltd., Dublin). This 165-page book consists of six chapters: "Tracing Ancestors and Relatives in Ireland," "Records and Record Repositories," "Irish County Maps" (from Samuel Lewis' 1837 A Topographical Dictionary of Ireland), "Irish Parish Registers," "Preliminary Research in Home Country," and "Emigrant Passenger Lists to America." It is followed by lists of record repositories, pedigrees in printed books, published family histories, common elements in placenames, and useful addresses, as well as a comprehensive index. My last resource is (A Genealogist's Guide to) Discovering Your Irish Ancestors: How to find and record your unique heritage by Dwight A. Radford & Kyle J. Betit (2001, Betterway Books, Cincinnati, Ohio). This is one of those newer helpful genealogical guidebooks laid out with icons in the margins listing "tip," "important!" or "reminder," and has internet and bibliographic resources in every chapter. I'll also read articles on Irish and Ulster Scots genealogy in the magazines I subscribe to, such as Internet Genealogy and Family Tree Magazine. Online resources I can use include Cyndi's List of genealogical links for Ireland and Northern Ireland and for Scotland, FamilySearch's Research Outlines for Ireland and Scotland, and searching Google Books for online Irish and Scottish publications. There are a number of researchers I know whose brains I can pick for more ideas, such as fellow members of my genealogical society and other genea-bloggers. One of my favorite new genealogy blogs is the Irish Roots Cafe blog by Michael O'Laughlin, who also hosts a website and podcasts, as well as publishes many books on Irish research. When it comes time for me to really start digging up my Irish roots, I don't think I'll be hurting for good resources! I was very excited to recently receive a copy of Evidence Explained: Citing History Sources from Artifacts to Cyberspace by Elizabeth Shown Mills (Genealogical Publishing Company, Baltimore, Maryland, 2007). As most of you are aware, this is the hot new book in the genealogical world. If you've been researching your family tree for any length of time, you probably recognize that the author is considered the leading authority in properly citing one's sources in genealogical research. Her last book on the subject, Evidence! Citation and Analysis for the Family Historian (also from GPC, 1997) and her publication, QuickSheet: Citing Online Historical Resources Evidence! Style (First Revised Edition, GPC, 2007), are integral to personal and public genealogical libraries around the country, if not the world. The first thing I noticed about Evidence Explained was the thickness and weight of the tome. While Evidence! is a paperback of 124 pages, and QuickSheet is a reference sheet published as a laminated folder for quick reference while working online, Evidence Explained is an 885-page hardback, weighing approximately 3 pounds! There's good reason for the size of the book. Ms. Mills has packed it full of lessons on analysis and citation as well as explanations and examples of sources and their corresponding citations. In the first chapter, "Fundamentals of Evidence Analysis," the author sets forth to instruct her readers on the necessity of analyzing the sources that genealogists and family historians come across while doing their research. It is not enough to have sources, she says; it is imperative that we learn to evaluate the quality of the source and step back to critique the circumstances under which the source was created, copied, archived, and presented to the public. This chapter is subdivided into the following topics: Basic Issues, Classes of Evidence, Problematic Concepts, Processed Records (Formats), and Textual Criticism. The second chapter is "Fundamentals of Citation," and its lessons are partitioned so: Basic Issues, Common Practices for Citing, Family History Library, Online Materials, Organization, and Stylistic Matters. A quote near the beginning of the chapter sets the stage for its purpose: "...once we have learned the principles of citation, we have both an artistic license and a researcher's responsibility to adapt those principles to fit materials that do not match any standard model" [pg. 41]. Since genealogists make discoveries in the most unusual sources (jewelry, family needlework and portraits, or personal mementos, for instance), "Fundamentals of Citation" gives both the structure and the liberty that each family historian needs to cite the facts unique to his or her own circumstances. These first two chapters ought to be required reading for anyone who is serious--or merely curious--about learning and recording the history of their family. They will answer questions and provide solutions to problems the reader may not have even previously considered. * "Local & State Records: Licenses, Registrations, Rolls & Vital Records"
* "Local & State Records: Property & Probates"
* "Publications: Books, CDs, Maps, Leaflets & Videos"
* "Publications: Legal Works & Government Documentation"
* "Publications: Periodicals, Broadcast & Web Miscellanea"
As you can see, there really isn't a resource that can't be covered in the above list. Each chapter begins with about 20 pages, colored gray for easy access, filled with citation examples of that particular topic, called QuickCheck Models. Every page of the QuickCheck Models contains a labeled Source List Entry, First (Full) Reference Note, and Subsequent (Short) Note example for a common source in that group. The main part of the chapter addresses the information itself, prefaced by a section on Basic Issues, as well as addressing any special circumstances these particular sources may create. They are then classified according to categories, and detailed explanations of what these resources may contain and how and why they need to be cited is precisely given. The body of the book is followed by an 11-page glossary of terms, a bibliography, the main index, and an index to the QuickCheck models. Although I've had this book for less than a month, I'm already finding that I'm using it on almost a daily basis, either for citing my sources in my family tree databases or here on my blog. It's everything I had hoped to find when I purchased the author's previous book on this topic. Evidence! left me a bit bewildered because I had so many source circumstances that didn't fit neatly into the models she gave. However, Evidence Explained not only gives me a wealth of examples that have, so far, covered every situation I've come across, but teaches me how to determine citations for examples she may not have given. As well, the lessons of the first two chapters were educational and enlightening for me, a genealogist by avocation. To purchase your own copy of Evidence Explained, visit the website of the publisher, Genealogical Publishing Company. This is the time of year when you can find all kinds of wonderful special offers on subscriptions to genealogical database websites or discounts on books and CDs at genealogical publications suppliers. One such place is Genealogical Publishing Company's website, www.genealogical.com. The 34 reference books in this sale run the gamut of our collection, from lineage society indexes, passenger lists, military records, vital records of all kinds, probate and land records, how-to books, and more. Geographical coverage includes many of the U.S. states east of the Mississippi, Canada, the British Isles, Germany, and the Caribbean. Although some of these sale items are now out of stock, you can still choose from many others in the waning moments of this terrific offer. Each year we drop prices drastically on scores of books in order to clear out our inventory...you will find over 50 books or multi-volume sets that, with very few exceptions, have been reduced in price by at least 50%. As a matter of fact, the majority of our liquidation books are on sale for between 67-75% below retail. This year you will also find a number of CD-ROM titles in the Liquidation Sale. CDs are always a good buy since they contain the page images of multiple books yet sell for as little as one-fourth the price of the books when purchased on their own. Since we have further reduced the prices on the following CDs by as much as 67%, you will be paying only pennies for the digital equivalent of some of these imaged books. Lastly, GPC offers its Warehouse Book Sale everyday of the year. These are books offered at permanent discounts of at least 40% and often 50% or more, to make room for new products. If you received some Christmas money to spend towards genealogical products, or perhaps wish to treat yourself after buying all your loved ones gifts, these sales may be just what you're looking for! Beth Baggott and her brother, Donald Bethke, of Grand Haven, Michigan, have been exchanging the same Christmas card for the past 50 years. The card has been exchanged every Christmas since, with each couple adding mentions of big events like births and children going off to college. For more on this story, read the article at the Grand Haven Tribune website here. I got up early this morning, just playing around on my family tree databases and various websites, waiting for the family to wake up so we could open gifts. Santa brought me two gifts this morning. The other I'm very happy about: I found my husband's paternal grandmother, Helen Mary WESTABY, and her parents, George Rice WESTABY, II and Rena LERFALD, along with George's brother Guy, in the 1920 U.S. Federal Census! I've been looking for them for years! Helen's obituary stated the family moved from the Rosebud or Dawson County area in Montana to Yakima County, Washington in 1920, so I figured they got missed during the move. Two years ago, my father-in-law told me about some trouble his grandfather George had with the law, and I figured there was a strong possibility that the family deliberately avoided the enumerator that census year. However, I recently re-examined some family mementos that documented George and Helen's residences in Forsyth, Rosebud County in 1922, which gave me cause to look once again at the 1920 census in Montana. I have looked for this family both on microfilm and online. I used the microfilmed Soundex of the 1920 census to attempt to find the family in all the western states, particularly Montana, Idaho, Washington, Oregon, California, and Wyoming. I used a variety of spellings, too, such as Westaby, Westby, Westerby, etc. I repeated many of these searches online as well. Today, I thought I would try again online. The search that had a successful result was a search for "George," born 1890 +/- 2 years, living in Montana. And here is the family, listed as Westerby, living on Prospect Street in Forsyth, Rosebud County. Why they didn't show up in all my previous searches, I'll never know! Image: Westaby, George Rice III household, Household 206, Dwelling 251, E. D. 123, page 11 A, Forsyth, Rosebud County, Montana, 1920 U.S. Federal Census. Image 21 of 38 viewed 25 Dec 2007 at Ancestry.com, (http://content.ancestry.com/Browse/list.aspx?dbid=6061&path=). This is my own Advent Calendar. It has pockets to put little candies or gifts in. I wasn't able to post my Advent Memories everyday the way I would have liked to, but I did end up writing a post for each one, backdating them so that they will appear on the correct day that they should. To view all my Advent Memories posts, click here. Again, thank you to Thomas and Jasia for putting this together, and for all their hard work! I've so enjoyed this walk down the Christmas memory lane, and I wish to thank Thomas and Jasia for coming up with such wonderful prompts. Special thanks to Thomas, for all his hard work in putting the Advent Calendar of Christmas Memories together. I don't know how you did it, in addition to writing down all your own memories as well! To my readers, I hope that you have enjoyed these, as well as the posts from my fellow genea-bloggers (I still have a few more of mine to backdate). It's never too late to write your own memories for your children, grandchildren, and future descendants, and I encourage you to do so. Jessica has posted the 2nd Carnival of Central and East European Genealogy at her blog, Jessica's Genejournal. I don't have any known Central or East European ancestry, but I enjoy reading the blogs of those who do. It's so interesting reading about other cultures and traditions, especially as they relate to genealogy! If you have ancestry from this area, you may wish to post your own article in the next carnival. The topic for the next carnival is on stories. Do any of your ancestors have stories of their homelands from Central or Eastern Europe? Are you familiar with any stories or folklore of countries from Central or Eastern Europe? The Next edition of the carnival will be due on January 25. You can submit your article here. Earlier today, I incorrectly stated that there was a third American World War I veteran, Louis Livingston, living in here in Spokane, Washington. I was wrong on both counts: he was not a veteran, and I discovered this evening that he passed away just this week on Wednesday, December 19th. My error was made when I misunderstood Eastern Washington Genealogical Society member John Ellingson, who had mentioned that Louis Livingston was the only living person in this area that John knew was listed on the WWI Draft Registration. Livingston actually never did serve, as the war ended only nine days after he registered for the draft, on November 11, 1918. If you would like to know more about Louis Livingston, you can read an online article published by our local paper, the Spokesman-Review, here. 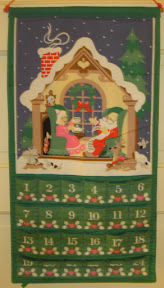 Every morning, I enjoy reading the latest Advent Calendar of Christmas Memories posts. I've been catching up on my own, and now have numbers 1 - 11 complete. I'm working hard to fill in the ones from when I was so busy the last week of school. I've also added pictures to a couple of ones already posted. The ones I've got in on time to be included in Thomas' daily posts have been sent to him fairly late at night (usually midnight, his time). He probably dreads getting e-mails from me ("can't that gal in Spokane get it together?"). This is what happens when you're competing for computer time with teenagers. They somehow think MySpace and Runescape are so much more important than blogging or genealogy. Sheesh! I've also been busy with Christmas preparations, like most of you out there. I've got my Christmas letter all written and mailed out (if you would like to get your own copy, just e-mail me; see my address in my profile). Last night I put together the dough and filling for banket, and today I'll roll it out, fill it, and bake it. I'll also bake up a casserole for my hubby's workplace's annual Christmas potluck dinner. Today's plans include finishing up my shopping, and perhaps getting started on the wrapping. Yesterday brought a nice surprise. We did not know that Norm's oldest niece, nephew-in-law, and grandniece (almost 3) were in town from Illinois. We haven't seen them since they left for Germany a couple of years ago; over the summer, they moved back to the states. They came by our house for a visit, since my husband is working longer hours due to the holidays, and won't be able to make it to the family holiday gathering this weekend. The highlight of my day was when little Evelyn, who doesn't remember me from past visits and was being a little shy, asked me to read a story to her! A month or so ago, a co-worker brought in a catalog of fund-raising merchandise her son's school was promoting. 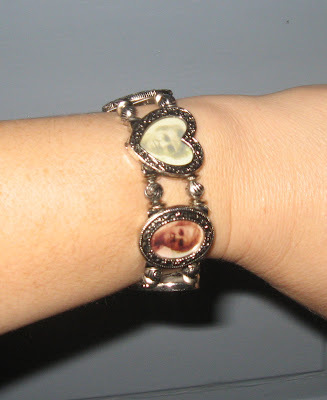 I saw this bracelet, and simply had to have it! Since it holds six photos in alternating heart- and oval-shaped marcasite-look frames, I've got copies of the six generations of women that I blogged about here. I've received many compliments, and it's a great genealogy conversation starter! Kathryn Beich is the fundraising company, but I can't find it on their website. EWGS members have been getting their due in the local paper lately. Yesterday's featured past president and current Bulletin editor Doris Woodward, who has written a book on Spokane's circus clown, Harper Joy. The Circus Room on the seventh floor of the world-famous Davenport Hotel honors Joy, and today, Doris will be conducting a book-signing at the Signature Store in the hotel from 4:00 - 7:00 PM. Complimentary hot cider and gingerbread cookies will be served. To read the article, go here. To read the full article without going through the subscription process, simply click the "printer-friendly" link near the top of the page. What genealogist doesn't love books? Kimbooktu is a blog about all things bookish, including reading accessories and book-themed furniture. Today is the one-year anniversary of the blog, authored by Kim from the Netherlands. Drop by, admire the great finds she's written about, and give her your congratulations. TOLEDO, Ohio — J. Russell Coffey, the oldest known surviving U.S. veteran of World War I, has died. The retired teacher, one of only three U.S. veterans from the “war to end all wars,” was 109. The article goes on to say that only two more American WWI veterans survive: Frank Buckles, 106, of Charles Town, West Virginia; and Harry Richard Landis, 108, of Sun City Center, Florida. It also mentions John Babcock, 107, the last known surviving Canadian WWI veteran, who lives here in Spokane. I'm a Naughty Elf! Janice Says So! Between the carnivals, the advent memories, and memes, we genea-bloggers have been partying hard this month, and I think Janice of Cow Hampshire has hit the punch a bit early! She put together several hilarious videos of my fellow bloggers, including a group of us naughty elves in Santa's workshop. These are a must-see! Thanks so much, Janice, for the gift of laughter! Yesterday afternoon at 3:15 I officially went on Christmas Break. Well, the politically correct term is "Winter Break," but you know what I mean! It took a couple of hours to pick up my kids, run errands, and then--once I got home--mess with the computer. (The weather's been wreaking havoc with everyone's Internet connection, says our ISP rep...afternoons and evenings we've been getting a weak signal to our desktop, and a weak-to-non-existent signal to our laptop.) So I didn't get a chance to really relax until after 5:00 PM. I've got a long list of to-dos, which I'm actually looking forward to. I'm truly a homebody, and I like doing things around the house, as long as they're not being undone right behind me, or I'm not being constantly interrupted. Besides the obvious plans of putting the finishing touches on Christmas and New Year's celebrations, I'm hoping to get quite a bit of writing and scanning done. My writing plans include lots of blogging, finishing up lesson plans and syllabuses for several classes I'm teaching in January, and catching up on e-mails. Scanning projects involve my ever-growing collections that need to be digitally preserved, recorded and analyzed, as well as stacks of borrowed family records and documents that need to be returned to their owners soon. I also look forward to spending time with family. During the school year we four are all scattered at our individual schools and workplaces; it'll be nice, especially, for my husband to see us all before he goes to work, as his work hours are opposite ours. He'll also get some time off, although not as much as we do. I'm looking forward to seeing extended family members as well. My oldest nephew's birthday is this weekend, and we'll all gather once again at Chuck E. Cheese's. My brother is expected to be in town from the west side of the state; we usually only see him during the holidays. Everyone is coming over to my house for Christmas Day, and I'm looking forward to my favorite part: watching the nephews (ages 3, 5, and 9) open their gifts! We'll be spending time with Norm's brother's family as well; we usually meet at their place either Christmas Eve or the day after Christmas for dinner and then gather around in the family room to watch a movie. Most of the Christmas shopping done when I was a girl was via Sears, Roebucks & Co., Montgomery Wards, or occaisionally, Jafco. We always got catalogs for those companies, and my favorite were the Christmas Wish Books. I loved all the dolls and accessories: clothes and bottles, strollers and carriages, cribs, high chairs, clothes. 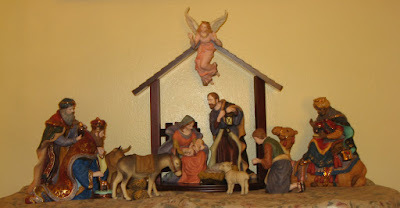 The footnoteMaven invited us genea-bloggers to go blog caroling. We've been posting favorite carols and sometimes a bit of history to go along with them. The Maven also posted a spectacular Choir of GeneaAngels graphic with links to our blog carols here. Boy, it's hard picking out a favorite, since I love most Christmas carols, both religious and secular. Also, being a bit late to the game, some of my favorites were already picked. For instance, Craig at GeneaBlogie posted "Silent Night." I've always loved the legend of how the German pastor and church choir director created a song they could play accompanied by a guitar when their church organ was damaged by hungry mice. Additionally, this was the song that briefly stopped World War I...until December 26th, 1914, when indignant officers insisted that the war must go on. Terry at Hill Country of Monroe County, Mississippi also blogged about another fave of mine, "I Heard the Bells on Christmas Day." Although I knew the history behind this song, I forgot that it was written by Longfellow, one of my favorite poets. And then my Salvation Army background gets a boost when I think of "Silver Bells,"
While Bing was born on the west side of the state, he grew up in Spokane and attended Gonzaga University until the siren call of the entertainment industry drew him to California. In fact, when I was pregnant with our son, we used to live across the street from his sister's home in what is now the City of Spokane Valley. I often wonder if, as Bing sang this song, he thought of snowy days in Spokane, sliding down the hill at Manito Park or skiing up at Mount Spokane? Wikipedia contributors, "Silver Bells," Wikipedia, The Free Encyclopedia, http://en.wikipedia.org/w/index.php?title=Silver_Bells&oldid=178588830 (accessed December 19, 2007). Berlin, Irving. "White Christmas." Lyrics. White Christmas, single. Decca Records, 1942. Lyrics007, http://www.lyrics007.com/Bing%20Crosby%20Lyrics/White%20Christmas%20Lyrics.html (accessed 17 December 2007). Both the Grand Rapids Press and the Muskegon Chronicle--newspapers from my ancestral cities in Michigan--carried this story, and no wonder! It's one of those "truth is stranger than fiction" stories, and does it ever have an ending that will warm your heart! For years, Steve Flaigg, an adoptee, had searched for his birth mother. Come to find out, she turned up to be a co-worker he had known for several months. Go here to read the rest of the story. This article has a personal connection for me. It mentions the D.A. Blodgett Home, an institution that figures largely in my family history. When my maternal grandfather's mother became ill and had to be institutionalized, several of his siblings were placed in the Blodgett Home for a while until after she died and their father remarried (he and another brother were placed in relatives' homes). Also, this was the place where my paternal grandmother and her brother were dropped off after their non-custodial father removed them from their mother's home in east Michigan. They lived there for just a short time before being fostered out and eventually adopted by two families in the same small west Michigan town. UPDATE: This article reoports that Flaigg and his birth mother, Christine Talladay, will be featured on several morning television shows, including NBC's Today show Thursday morning and perhaps Fox's Fox and Friends on Friday morning. "The New Millennium" is the topic of the 38th Carnival of Genealogy, which Jasia has just posted over at Creative Gene. Were you Y2K ready? How did you ring in 2000? Someday our great-grandchildren will be wondering; have you written about this event for your descendants? Fourteen genea-bloggers share their stories in this carnival. As usual, they offer a variety of experiences and unique perspectives on this event. My post on this topic is "The Midkiff Family: Y2K Ready." The topic for the 39th Carnival of Genealogy will be "New Year's Resolutions." Jasia writes, "As the year winds to a close in the next couple weeks it's a good time to review the progress made in our genealogy research and to make a plan for next year. So what did you accomplish last year and what road blocks did you encounter? What are your research goals for next year and how do you resolve to attain them?" The deadline will be January 1st, and can be submitted here. The 2nd Cabinet of Curiosities Carnival is posted at Tim Abbott's Walking the Berkshires. This blog carnival highlights various interesting and bizarre objects that bloggers have collected, some from their ancestors' pasts, others from the modern era. There are 13 submissions to this carnival, and do they ever look interesting! My own submission was about the buttonhook of my husband's great-great-grandmother, posted here. For next month's carnival (submission deadline: January 19th), Tim suggests that we look at our Christmas trees to see if we find a curiosity to share. What about you? Do have an unusual keepsake to write about? *1960 - Norm would have been 3, living with his parents (father: 26; mother: 27) and younger brother, age 9 months in Outlook, Yakima County, Washington. *1970 - the family, which by then included his 36-year-old dad, his 37-year-old mother, his almost 11-year-old brother, a six-year-old sister, and another brother, 4 1/2, lived in the Fruit Valley neighborhood of Vancouver, Clark County, Washington. Norm was 13. The following year, the family moved to the same neighborhood--but not the same house--where his parents live today. *1980 - He was attending college and living in an apartment near the courthouse in Vancouver. *from 1990 through 2005, the census data is the same as mine. I think I'll go e-mail my parents and ask them about their census year residences (1950 and 1960) before they were married and started a family. Meme: Where Were You During the Censuses? Advent Memories No. 14: Fruitcake--Friend or Foe?